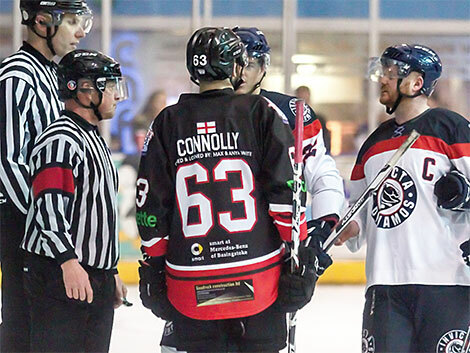 The Invicta Dynamos faced an uphill battle in the fight to extend their season after losing out 6-0 on the road to the Basingstoke Bison as the league champions secured a sizeable advantage in the first leg of the playoff quarterfinals. Head Coach Kevin Parrish had the luxury of a full strength team on this occasion which also included youngster Jake Stedman. The first period was end-to-end action with both teams playing quick counter attacking ice hockey however, despite the constant action, clear cut changes were limited. The Mos had an opportunity on 04.15 with Louis Colvin demonstrating his speed to beat an opponent and cut a pass across goal which Ashley Jackson got an edge to but the puck flicked over the crossbar of Dean Skinns. At the other end Ivan Antonov fired wide of the Dynamos net with netminder Damien King untroubled. Bison import Roman Malinik had similar luck a few minutes later with both goalies still waiting to make a meaningful save. It was Grant Rounding who finally called King into action but with little power on the shot he easily made the puck safe. A break by Scott Bailey on 17 minutes almost led to the Mos having a great opportunity but the pass was an inch away from Brandon Webster who would have been in a good position to test Skinns. The first period ended at 0-0 and with no penalties on either team. Skinns only facing 4 shots and King 7. In the second period Bison upped their game a gear. Ivan Antonov warmed-up King’s glove on 20.18 and Aaron Connolly also had an attempt saved seconds later. Bison finally broke the deadlock on 23.05 – Stuart Mogg collecting the puck from out wide on the blue line and hitting a rising shot over King’s shoulder for 1-0. Bison continued to press and the Dynamos had King to thank for preventing Grant Rounding and Josh Smith from doubling the lead. The first penalty of the game came on 26.20 with Ondrej Zosiak sitting in the penalty box for 2 minutes after slashing. The home side soon took advantage and notched the second goal on 27.03 through danger man Tomas Karpov who slotted past the netminder after finding room to fire the shot – assists going to Dan Davies and Aaron Connolly. Karpov grabbed his second of the night on 30.02 for 3-0 and Davies again being the provider. The Mos did make Skinns work however and Brandon Webster can count himself unlucky when his shot was saved by an outstretched leg of the netminder in the 31st minute. Hallam Wilson and Dan Scott were then frustrated by King before the Mos were again defending a powerplay on 36.11 after a Mason Webster cross check. The powerplay was again good for the Bison with them going 4-0 up on 38.02 with Kurt Reynolds finding the back of the net and assisted by Malinik and Smith to end a frustrating second period for the Mos who only hit 2 shots on the Bison net whilst the hosts hit 23 at King. The final period started with King in the action yet again – this time keeping Connolly at bay. The Mos however did have chances when Jackson teed-up Strawson for a slapshot which Skinns was equal to and then Steve Osman also registered a shot which Skinns got down well to knock away from any in-rushing Mos players. Later in the period Skinns then got a touch on Scott Bailey’s shot with time running out for Mos to wipeout a shutout. On 54.39 former Dynamo defenceman Elliott Dewey assisted Roman Malinik for 5-0 and 4 minutes later Dewey again turned provider, this time for Ryan Sutton to wrap-up the scoring at 6-0 to the Bison. The Invicta man of the match went to Damien King who faced 42 shots in total and for the host, Kurt Reynolds took the honours having scored the 4th goal of the match.